is most commonly understood as a belief in the real, true essence of things, the invariable and fixed properties which define the ‘whatness’ of a given entity … Importantly, essentialism is typically defined in opposition to difference … The opposition is a helpful one in that it reminds us that a complex system of cultural, social, psychical, and historical differences, and not a set of pre-existent human essences, position and constitute the subject. However, the binary articulation of essentialism and difference can also be restrictive, even obfuscating, in that it allows us to ignore or deny the differences within essentialism (Essentially Speaking : xi-xii). As evidenced by the range of the critics quoted below, the term essentialism spreads across multiple fields of study. The fact that this page exists as part of a postcolonial studies web site points both to the broad-based nature of postcolonial studies and to the debate on where the borders of postcolonial studies should be drawn, if at all. In a specifically postcolonial context, we find essentialism in the reduction of the indigenous people to an “essential” idea of what it means to be African/Indian/Arabic, thus simplifying the task of colonization (see Myths of the Native). Nationalist and liberationist movements often “write back” and reduce the colonizers to an essence, simultaneously defining themselves in terms of an authentic essence which may deny or invert the values of the ascribed characteristics (see discussions on reclaiming the term “Third World,” particularly in Chandra Mohanty’s “Introduction”to Third World Women and the Politics of Feminism, ed. Chandra Mohanty, Ann Russo, and Lourdes Torres  1-47). Edward Said argues against this inversion, suggesting that “in Post-colonial national states, the liabilities of such essences as the Celtic spirit, négritude, or Islam are clear: they have much to do not only with the native manipulators, who also use them to cover up contemporary faults, corruptions, tyrannies, but also with the embattled imperial contexts out of which they came and in which they were felt to be necessary” (Culture and Imperialism  16). Salman Rushdie describes essentialism as “the respectable child of old-fashioned exoticism. It demands that sources, forms, style, language and symbol all derive from a supposedly homogeneous and unbroken tradition. Or else” (“‘Commonwealth Literature Does Not Exist,” Imaginary Homelands: Essays and Criticism 1981-1991 (1991) 67). Wole Soyinka strikes a similar note in his analysis of the potential pitfalls of an essentialist movement such as Négritude, which “stayed within a pre-set system of Eurocentric intellectual analysis of both man and his society, and tried to re-define the African and his society in those externalized terms”(Myth, Literature and the African World (1976) 129, 136) (see Frantz Fanon). Every path I/i take is edged with thorns. On the one hand, i play into the Savior’s hands by concentrating on authenticity, for my attention is numbed by it and diverted from other important issues; on the other hand,i do feel the necessity to return to my so-called roots, since they are the fount of my strength, the guiding arrow to which i constantly refer before heading for a new direction (“Writing Postcoloniality and Feminism” in The Post-colonial Studies Reader, ed. Bill Ashcroft, Gareth Griffiths, and Helen Tiffin  268). Ngũgĩ wa Thiong’o is certainly less troubled by this quandary. Ngũgĩ complicates the issue by placing the question of language at the base of the debate: “[t]he choice of language and the use to which language is put is central to a people’s definition of themselves in relation to their natural and social environment … by our continuing to write in foreign languages, paying homage to them, are we not on the cultural level continuing that neo-colonial slavish and cringing spirit?” (Decolonising the Mind: the Politics of Language in African Literature (1986) 4, 26). Interestingly enough, where Ngũgĩ would disagree with Rushdie and Soyinka on issues of essentialism or authenticity, he also differs on language: Ngũgĩ has chosen to reject English for Gikuyu and Kiswahili (in fact, Decolonising the Mind is Ngugi’s “farewell to English”), whereas Rushdie and Soyinka have chosen to write in English. These writers represent, at best, a mere cross-section of those who concern themselves with questions of essentialism and authenticity. Ironically, the very process of selecting these writers and these quotations depends on the use of essentialism and representation. As Donna Landry and Gerald MacLean, the editors of The Spivak Reader (1996), put it, one “cannot simply assert, ‘I will be anti-essentialist’ and make that stick, for you cannot not be an essentialist to some degree. 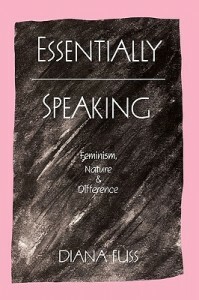 The critique of essentialism is predicated upon essentialism” (7). Minh-Ha, Trinh T. Writing Postcoloniality and Feminism”. The Post-colonial Studies Reader, ed. Bill Ashcroft, Gareth Griffiths, and Helen Tiffin, 1995. 264-268. Mohanty, Chandra.”Introduction”. Third World Women and the Politics of Feminism, ed. Chandra Mohanty, Ann Russo, and Lourdes Torres  1-47. Rushdie, Salman. Imaginary Homelands: Essays and Criticism 1981-1991. London: Routledge, 1991. Said, Edward. Culture and Imperialism, London: Vintage, 1994. Soyinka, Wole. Myth, Literature and the African World. Cambridge: Cambridge University Press, 1976. Spivak,Gayatri Chakravorty. “Subaltern Studies: Deconstructing Historiography”. Selected Subaltern Studies. Ed. Ranajit Guha and Gayatri Chakravorty Spivak. Oxford: Oxford University Press, 1988. ”Introduction”. ed. Donna Landry and Gerald MacLean. The Spivak Reader, 1996. 1-12.
wa Thiong’o, Ngũgĩ. Decolonising the Mind: the Politics of Language in African Literature. Westlands: East African Educational Publishers, 1986. This is a profoundly savvy review. As we are on the present issue, kindly allow me to share a motivational show that gives an account of the forgotten careers of the main visionaries who eluded the color hindrances. By remembering the milestones of the African community who masterminded our communal, intellectual and administrative organizations, True First reestablishes a consequentially ellaborate record. Read about legends like Sidney Poitier as well as Debi Thomas.